One of the greatest motorcycling spectacles events in Malaysia will hit the 29km beach of Desaru this year! One of the greatest motorcycling spectacles events in Malaysia will hit the 29km beach of Desaru and surrounding this September as Desaru Coast will be the key venue. The thunderous sound of loud pipes from the thousands of big and small bikes literally creating sensation in your chest as 50,000 motorcycle enthusiast, local and international clubs and visitors rolled through the southland of Johor Darul Ta’zim to gather and celebrate the 1st Desaru International Bike Week (DIBW) 2019. “Malaysia bike scene is rich with multi-diverse groups from all sorts of biking backgrounds, and bike weeks that are happening through-out the year has added the element of togetherness in Malaysia biking scene that makes us bind in the spirit of brotherhood,” said Dato’ Sri Shahrizal Ishak, Founder, 2019 Desaru International Bike Week (DIBW). “Realizing the importance of strengthening the spirit of brotherhood and to enliven Malaysia and also Asean biking scene, DIBW Committee in collaboration with the sate of Johor Darul Ta’zim, is humbled and proud to announce 2019 Desaru International Bike Week (DIBW),” said Dato’ Sri Shahrizal Ishak, Founder, 2019 Desaru International Bike Week (DIBW). 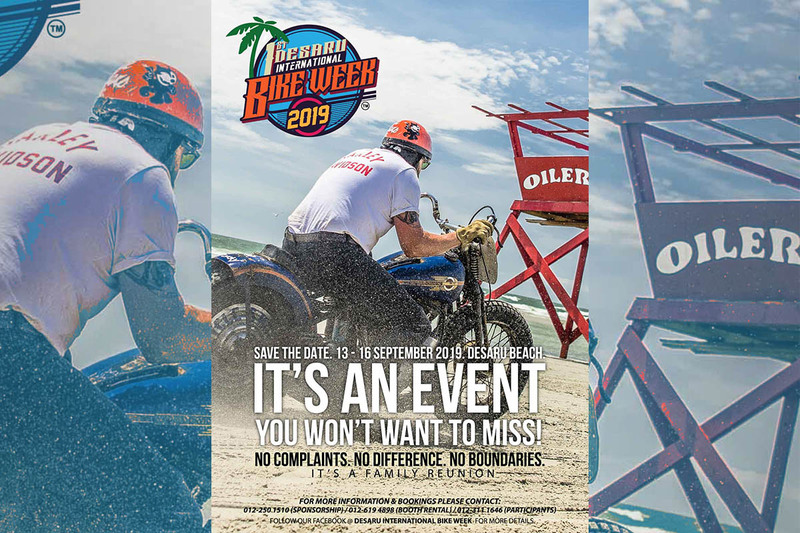 DIBW2019 initiated from a group of passion Harley-Davidson enthusiast that dreamt of bring together Malaysia own Daytona Bike Week with a pinch of beach motorsport elements. To be held in the beau of Desaru Beach, Desaru, Johor Darul Ta’zim from the 13 till 16 September 2019, DIBW2019 are grateful and blessed with Duli Yang Amat Mulia Tunku Ismail Idris Ibni Sultan Ibrahim as the royal patron. These event contents will set a new height in Malaysia biking scene. The organizer also shared their ambition to make DIBW2019 in the near future to become an exchange platform for cultural, art, music that will expand the horizon of Malaysia motor sport bike event industry.